In a state where summer is the shortest, most uncertain season, every ripe tomato is a triumph. That's why Shepherd and Ellen Ogdens' annual tomato-tasting party is one of the signature events of the summer in Vermont. And what tomatoes! From marble to softball size, in hues from burgundy to white, with names such as 'Rose of Berne' and 'Red Currant,' they are the best from the Ogdens' seed company, The Cook's Garden. The Vermont summer starts winding down as soon as it begins, so you might think tomato growers there would plant only the newest hybrids -- bred for speed, small and not especially tasty. But for the real Vermont tomato lover, the season is too short to waste on some insipid modern variety. 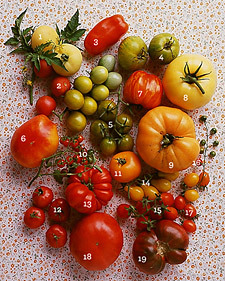 Shep Ogden has spent decades hunting down the most flavorful (and beautiful) heirloom tomatoes-for gardeners everywhere. Some would say that old varieties aren't tough enough to make it in harsh Zone 4. Shep likes to prove them wrong. So one August evening, the Ogden family and a handful of friends gather to sample some 40 varieties of tomatoes grown by Shep with Rich and Libby Davidson, who manage his display garden. This year, neighbor Maggie Doerfer has brought a few of the tomatoes raised at her market garden, too. Equipped with scorecards and a tomato craving built up through the long winter, guests eat their fill. As dusk gathers, there's time to ponder the question: Which is more important to taste, nature or nurture? You can't make a badly bred tomato taste good, but Shep maintains that the proper growing technique can improve the flavor of a good variety. His pet theory relies on the fruit-to-foliage ratio. It's all about photosynthesis, the chemical reaction that creates flavor. The more foliage left on the plant, the more photosynthetic activity, the more intense the flavor of the fruit. That's why Shep's plants are so bushy. Unlike hybrids, which are usually bred to be compact and well-behaved, most heirlooms are "indeterminate," meaning the plants grow uncontrollably, right up to frost. Most gardeners are tempted to prune them to a single, or at least double, stem, but Shep keeps pruning to a minimum. For the fullest flavor, tomatoes require full sun for at least eight hours a day. Raising the plants off the ground on a trellis helps to expose the foliage and fruit to the light (Shep uses four-pole bamboo tepees). And because heirlooms can be more susceptible than hybrids to fungal diseases, trellising helps to promote health by allowing air to circulate. Excessive watering can dilute tomato taste, and underwatering stresses the plant and inhibits flavor production, so maintain an even moisture by planting in a soil that's rich in organic matter and covered with a thick natural mulch, such as hay or straw. To give plants a boost, use a bagged organic fertilizer (one that's higher in phosphorus than in nitrogen), whose nutrients are released slowly over the course of the season. Choosing the best among the fruits of Shep's labors always inspires friendly debate; in fact, year after year, it's impossible to pick a single winner. At this tasting, Shep's daughter, Molly, casts her ballot for 'Yellow Pear'; his son, Sam, likes 'Green Zebra'; Ellen backs 'Sungold'; and Shep himself can't decide between 'Persimmon' and 'Big Rainbow.' There is already a chill in the air by the time the votes have been tallied, but all agree that they have had a sweet and tart taste of summer. 2. 'Red Peach' is also fuzzy, but ripens to a more conventional color; it tastes mild and sweet. 3. 'San Marzano' has been grown for sauce and paste in Italy for decades; its rich and acidic flavor makes it good for drying. 4. 'Green Zebra' always scores well with kids because of its stripes and sweetness; plants are vigorous and productive. 5. 'Green Grape,' a cherry type, starts pale green and ripens to olive; very high yield with good sugary flavor. 6. 'Big Rainbow' is large and bright yellow with red marbling through the sweet flesh; it's resistant to foliar diseases. 7. 'Schimmeig Striped Hollow' ripens to red with bright orange stripes throughout; because it is hollow and lacks juicy pulp, the flavor is bland. 8. 'White Wonder' ripens from green to ivory, has a mild and sweet flavor. 9. Meaty and rich, with a sweet, mild gel, 'Amana Orange' is excellent for slicing -- one of these tomatoes can weigh as much as a pound. 10. 'Red Currant' has shiny fruits clustered on filigreed vines; flavor is intensely sweet, but skin tends to crack. 11. 'Golden Girl' is a hybrid golden cherry type with a rich, complex flavor. 12. 'Togo Trifle,' from West Africa, has a ruffled shape and excellent sweet-and-tart flavor. 13. Tart 'Costoluto Genovese' is a traditional multipurpose heirloom from Italy; excellent for sauce. Look for strains resistant to the diseases fusarium and verticillium wilt. 14. First recorded in 1805, 'Yellow Pear,' produces huge quantities of mild, almost lemony-tasting, tiny yellow fruits on vigorous vines. 15. 'Red Pear' is a version of the yellow variety; both are most flavorful straight from the vine or only lightly cooked. 16. 'Spoon,' a modern variety bred for diminutive size, is more tomatoey than sweet. 17. 'Cheesemanii' is an inconsistent strain of cherry tomato; some plants produce yellow fruit,others red. 18. 'Soldacki' is a Polish version of the venerable American 'Mortgage Lifter,' known for its resistance to diseases, and its sweettart taste. 19. 'Brandywine' is the gold standard by which tomato taste is measured; its complex fusion of sugars and acids creates the ultimate tomato taste. 'Pruden's Purple' has a similar flavor, but matures earlier.